01. The objective of this Standard is to prescribe accounting principles and treatment for related party disclosures and transactions between a reporting enterprise and its related parties in the financial statements. 02. This Standard should be applied in dealing with related parties and transactions between a reporting enterprise and its related parties. The requirements of this Standard apply to the financial statements of each reporting enterprise. This Standard applies only to those related party relationships described in paragraph 04, as modified by paragraph 07. (e) enterprises in which a substantial interest in the voting power is owned, directly or indirectly, by any person described in (c) or (d) or over which such a person is able to exercise significant influence. This includes enterprises owned by directors or major shareholders of the reporting enterprise and enterprises that have a member of key management in common with the reporting enterprise. In considering each possible related party relationship, attention is directed to the substance of the relationship, and not merely the legal form. 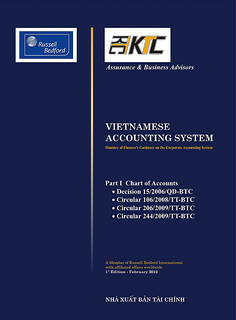 (c) in financial statements of a wholly-owned subsidiary if its parent is incorporated in Vietnam and provides consolidated financial statements in Vietnam. Related party: parties are considered to be related if one party has the ability to control the other party or exercise significant influence over the other party in making financial and operating decisions. Related party transaction: a transfer of resources or obligations between related parties, regardless of whether a price is charged. Control: ownership, directly, or indirectly through subsidiaries, of more than one half of the voting power of an enterprise, or a substantial interest in voting power and the power to direct, by statute or agreement, the financial and operating policies of the management of the enterprise. Significant influence: participation in the financial and operating policy decisions of an enterprise, but not control of those policies. Significant influence may be exercised in several ways, such as representation on the Board of Directors, participation in the policy making process, material inter-company transactions, interchange of managerial personnel or dependence on technical information. Significant influence may be gained by share ownership, statute or agreement. With share ownership, significant influence is presumed in accordance with the definition contained in VAS 07 “Accounting for Investments in Associates”. (c) a single customer, supplier, franchisor, distributor, or general agent with whom an enterprise transacts a significant volume of business merely by virtue of the resulting economic dependence. 07. Related party relationships are a normal feature of commerce and business. For example, enterprises frequently carry on separate parts of their activities through subsidiary or associated enterprises and acquire interests in other enterprises - for investment purposes or for trading reasons - that the investing company can control or exercise significant influence on the financial and operating decisions of its investee. 08. A related party relationship could have an effect on the financial position and operating results of the reporting enterprise. Related parties may enter into transactions which unrelated parties would not enter into. Also, transactions between related parties may not be effected at the same amounts as between unrelated parties. 09. The operating results and financial position of an enterprise may be affected by a related party relationship even if related party transactions do not occur. The mere existence of the relationship may be sufficient to affect the transactions of the reporting enterprise with other parties.For example, a subsidiary may terminate relations with a trading partner on acquisition by the parent of a fellow subsidiary engaged in the same trade as the former partner. Alternatively, one party may refrain from acting because of the significant influence of another - for example, a subsidiary may be instructed by its parent not to engage in research and development. 10. Because there is an inherent difficulty for management to determine the effect of influences which do not lead to transactions, disclosure of such effects is not required by this Standard. 11. Accounting recognition of a transfer of resources is normally based on the price agreed between the parties. Between unrelated parties the price is an arm's length price. Related parties may have a degree of flexibility in the price-setting process that is not present in transactions between unrelated parties. 13. Comparable uncontrolled price method sets the price by reference to comparable goods sold in an economically comparable market to a buyer unrelated to the seller. This method is often used where the goods or services supplied in a related party transaction, and the conditions relating thereto, are similar to those in normal trading transactions. It is also often used for determining the cost of finance. 14. Under the resale price method, the transfer price to the reseller is determined by reducing the resale price by a margin, representing an amount from which the re-seller would seek to cover his costs and make an appropriate profit. There are problems of judgment in determining a compensation appropriate to the re-seller's contribution to the process. This method is often used where goods are transferred between related parties before they are sold to an independent party. This method is also used for transfers of other resources, such as rights and services. 15. The cost-plus method seeks to add an appropriate mark-up to the supplier's cost. Difficulties may be experienced in determining both the elements of cost attributable and the mark-up. Among the yardsticks that may assist in determining transfer prices are comparable returns in similar industries on turnover or capital employed. 16. Sometimes prices of related party transactions are not determined under one of the methods described in paragraphs 14, 15, 16 above. Sometimes, no price is charged - as in the examples of the free provision of management services and the extension of free credit on a debt. 17. Sometimes, transactions would not have taken place if the relationship had not existed. For example, a company that sold a large proportion of its production to its parent company at cost might not have found an alternative customer if the parent company had not purchased the goods. 18. Financial statements are required to give disclosures about certain categories of related parties. Attention is focused on transactions with the directors of an enterprise, especially their remuneration and borrowings, because of the fiduciary nature of their relationship with the enterprise, as well as disclosures of significant inter-company transactions and investments in and balances with group and associated companies and with directors. VAS 25 “Consolidated Financial Statements and Accounting for Investments in Subsidiaries”, and VAS 07 “Accounting for Investments in Associates” require disclosure of a list of significant subsidiaries and associates. Accounting Standard “Net Profit or Loss for the Period, Fundamental Errors and Changes in Accounting Policies” requires disclosure of items of income and expense within profit or loss from ordinary activities that are of such size, nature or incidence that their disclosure is relevant to explain the performance of the enterprise for the period. 20. Related party relationships where control exists should be disclosed irrespective of whether there have been transactions between the related parties. 21. In order for a reader of financial statements to form a view about the effects of related party relationships on a reporting enterprise, it is appropriate to disclose the related party relationship where control exists, irrespective of whether there have been transactions between the related parties. 22. If there have been transactions between related parties, the reporting enterprise should disclose the nature of the related party relationships as well as the types of transactions and the elements of the transactions. 24. Items of a similar nature may be disclosed in aggregate except when separate disclosure is necessary for an understanding of the effects of related party transactions on the financial statements of the reporting enterprise. Disclosure of transactions between members of a group is unnecessary in consolidated financial statements because consolidated financial statements present information about the parent and subsidiaries as a single reporting enterprise. Transactions with associated enterprises accounted for under the equity method are not eliminated and therefore require separate disclosure as related party transactions.